The year of 1851 is important in the history of Portland, for many of the pioneers of the city and state whose memory still lives crossed the plains or landed from sailing vessels and took up their residence in the young village that year. Patrick Raleigh, for whom R street was renamed, was one of these and came with his family by steamer, having shipped a cargo of merchandise by sailing vessel. He was born in Ireland on January 1, 1817, and married Mary Louise Kain in 1844 just before be emigrated to New York. Coming to Portland in 1851, he established a merchandise store on the southeast corner of First and Stark streets and the building which he erected there still stands, one of the first brick structures built in Portland. Later he took up land in Yamhill county and engaged in cattle raising and farming. There he had the reputation of being on of the few who were not molested by the Indians on account of his honest dealing with them. He held great confidence in the future of Portland and became the owner of much land, one piece, known as Raleigh’s out-lot, embracing the triangular piece extending from Stark to Ankeny and from Broadway to Twelfth street. On the lot where the Imperial hotel now stands he built his home which stood for many years. Descendants living in Portland now are Matilda Gearin and family, Alma Raleigh, widow of Albert E. Raleigh, and Dr. William A. Trimble. 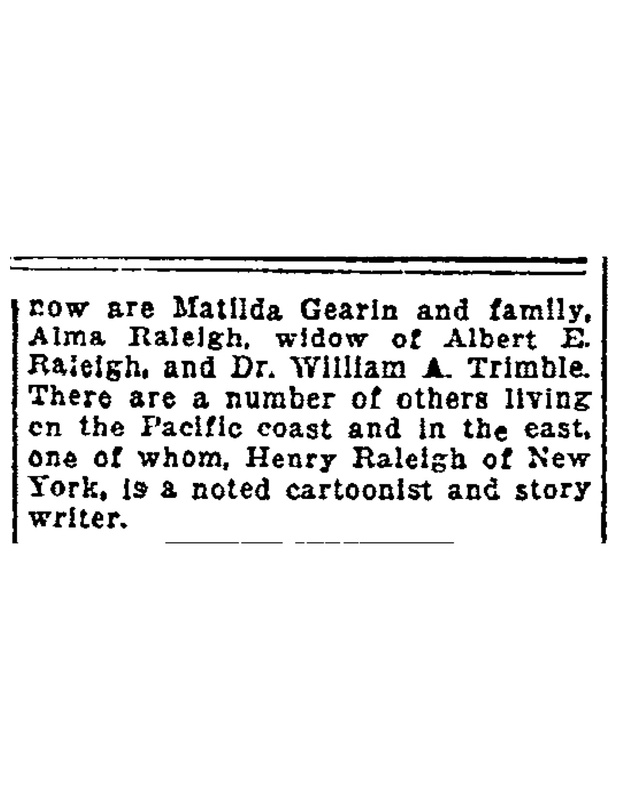 There are a number of others living on the Pacific Coast and in the east, one whom, Henry Raleigh of New York, is a noted cartoonist and story writer.